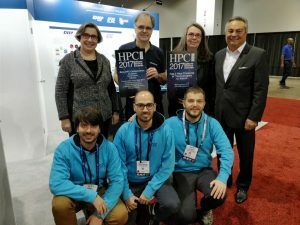 Editors’ Choice: Best HPC Collaboration (Academia/Government/Industry): Mont-Blanc, European R&D projects investigating a new type of energy-efficient computer architecture for HPC, leveraging Arm processor. 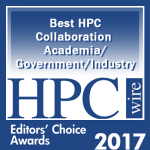 The coveted annual HPCwire Readers’ and Editors’ Choice Awards are determined through a nomination and voting process with the global HPCwire community, as well as selections from the HPCwire editors. The awards are an annual feature of the publication and constitute prestigious recognition from the HPC community. “The Mont-Blanc Partners are extremely honored to receive this award. It acknowledges our collective and pioneering effort to demonstrate the viability of using Arm technology for HPC, and to develop the Arm HPC ecosystem. Back in 2011, when Mont-Blanc started, our vision was not shared by many. But the recent surge of interest for Arm processors in the HPC community is proving us right!” explained Etienne Walter, Atos, coordinator of the Mont-Blanc 3 project. One of the outcomes of the Mont-Blanc project was recognized by another award: Atos has won the “Editors’ Choice award – Top 5 New Products or Technologies to Watch” for its BullSequana X1310, an Arm-based server derived directly from the latest prototype developed for Mont-Blanc. Academic/research HPC centres: Barcelona Supercomputing Centre (Spain); Swiss Federal Institute of Technology in Zurich (Switzerland); Centre National de la Recherche Scientifique (CNRS/LIRMM – France); University of Stuttgart (HLRS -Germany); University of Cantabria (Spain); University of Graz (Austria); University of Versailles Saint Quentin (France).